The default view is to sort your tags alphabetically. 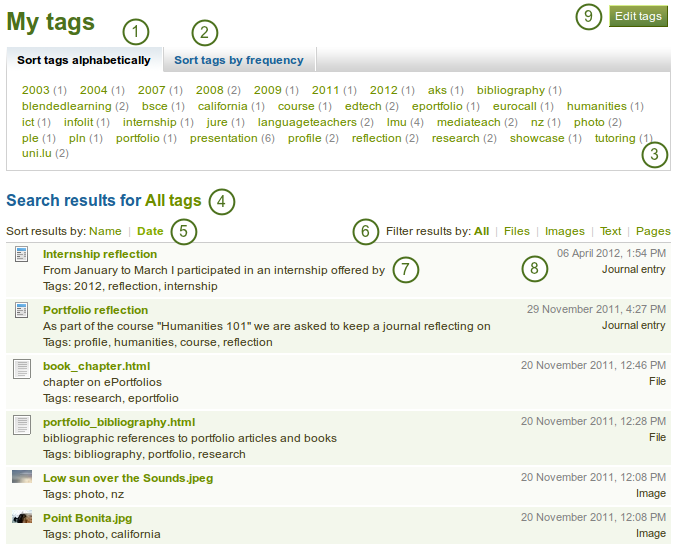 You can also sort tags by frequency showing the most frequently used tags first. You can click on any tag and filter the artefacts and pages you have according to them. The number in parentheses tells you how many times a tag occurs in your resources. The filter term is repeated. You can sort the results by their title or date. You can filter your results by specific artefact types or just show portfolio pages. Select the tag that you want to edit. Once you have selected your tag, it is highlighted in bold in the list and two new boxes appear. You can provide the new name for your tag under Name. Alternatively, click the Delete button to delete this tag.